J. Palisa discovered asteroid #299 Thora. E. Ernst discovered asteroid #705 Erminia. G. Neujmin discovered asteroid #769 Tatjana. K. Reinmuth discovered asteroid #1077 Campanula. E. Delporte discovered asteroid #1124 Stroobantia. Born, Riccardo Giacconi, Italian-born American astrophysicist, Nobel 2002 with Davis and Koshiba "for pioneering contributions to astrophysics, which have led to the discovery of cosmic X-ray sources"
K. Reinmuth discovered asteroids #1204 Renzia, #1205 Ebella, #1223 Neckar, #1782 Schneller, #1941 Wild, #3379 Oishi and #3555. USSR's Luna 3 passed within 6,200 km of the Moon near the south pole at its closest approach and continued past where it took the first pictures of the far side of the Moon. The spacecraft was a cylindrical cannister with hemispherical ends and a wide flange near the top end. The probe was 130 cm long and 120 cm at its maximum diameter at the flange. Most of the cylindrical section was roughly 95 cm in diameter. The cannister was hermetically sealed and pressurized at 0.23 atmospheres. Solar cells mounted on the outside of the cylinder provided power to the chemical batteries inside the spacecraft. Shutters for thermal control were also positioned along the cylinder and were designed to open to expose a radiating surface when the interior temperature exceeded 25 degrees C. The upper hemisphere of the probe held the covered opening for the cameras. Four antennae protruded from the top of the probe and two from the bottom. Other scientific apparatus (micrometeoroid and cosmic ray detectors) was mounted on the outside of the probe. Gas jets for attitude control were mounted on the outside of the lower end of the spacecraft. Photoelectric cells were used to maintain orientation with respect to the Sun and Moon. The spacecraft had no rockets for course adjustment. The interior of the spacecraft held the cameras and film processing system, radio equipment, propulsion systems, batteries, gyroscopic units for attitude control, and circulating fans for temperature control. The spacecraft was spin stabilized and was directly radio-controlled from Earth. The imaging system on Luna 3 was designated Yenisey-2 and consisted of a dual lens camera, an automatic film processing unit, and a scanner. The lenses were a 200 mm focal length, f/5.6 aperture objective and a 500 mm, f/9.5 objective. The camera carried 40 frames of temperature- and radiation resistant 35-mm isochrome film. The 200 mm objective could image the full disk of the Moon, and the 500 mm could take an image of a region on the surface. The camera was fixed in the spacecraft and pointing was achieved by rotating the craft itself. A photocell was used to detect the Moon and orient the upper end of the spacecraft and cameras towards it. Detection of the Moon signaled the camera cover to open and the photography sequence to start automatically. After photography was complete, the film was moved to an on-board processor where it was developed, fixed, and dried. On command from Earth, the film was moved to a scanner where a bright spot produced by a cathode ray tube was projected through the film onto a photelectric multiplier. The spot was scanned across the film and the photomultiplier converted the intensity of the light passing through the film into an electric signal which was transmitted to Earth. Frames were scanned with a resolution of 1000 lines, the transmission could be done at a slow rate for large distances from Earth and a faster rate at closer range. After launch on an 8K72 (number I1-8) on a course over the Earth's north pole, the Blok-E escape stage was shut down by radio control from Earth at the proper velocity to put the Luna 3 on a figure-eight trajectory which brought it over the Moon and around the far side, which was sunlit at the time. Initial radio contact showed the signal from the probe was only about half as strong as expected and the interior temperature was increasing. The spacecraft spin axis was reoriented and some equipment shut down resulting in a drop in temperature from 40 degrees C to about 30 degrees C. At a distance of 60,000 to 70,000 km from the Moon, the orientation system was turned on and the spacecraft rotation was stopped. The lower end of the station was oriented towards the Sun, which was shining on the far side of the Moon. The spacecraft passed within 6,200 km of the Moon near the south pole at its closest approach at 14:16 UT on 6 October 1959 and continued on to the far side. On 7 October the photocell on the upper end of the spacecraft detected the sunlit far side of the Moon and the photography sequence started. The first image was taken at 03:30 UT at a distance of 63,500 km from the Moon's surface and the last 40 minutes later from 66,700 km. A total of 29 photographs were taken, covering 70% of the far side. After the photography was complete the spacecraft resumed spinning, passed over the north pole of the Moon and returned towards the Earth. Attempts to transmit the photographs to Earth began on 8 October but were believed to be unsuccessful due to the low signal strength. The photographs were scanned and 17 resolvable but noisy photographs were transmitted to ground stations by radio in facsimile form on 18 October 1959, as the spacecraft, in a barycentric orbit, returned near the Earth. The photographs were to be retransmitted at another point close to Earth but were not received. Contact with the probe was lost on 22 October. The probe was believed to have burned up in the Earth's atmosphere in March or April of 1960, but may have survived in orbit until after 1962. USSR launched Cosmos 47 from Baikonur, an unmanned precursor to the Voskhod I flight, with orbital data nearly identical to the 12 October flight of Voskhod I. The capsule was recovered just over 24 hours after launch. The US Navy launched the Transit 5B-4 NNS 30010 navigation satellite from Vandenberg, California, on a Thor Able-Star booster which also carried the Calsphere 1 and Calsphere 2 calibration satellites to orbit. NASA and the USAF launched X-15A Checkout mission # 173 in which Michael Adams achieved a maximum speed of 3182 kph (Mach 3.00) and a maximum altitude of 22.982 km. The engine shut down at 90 seconds, leading to an emergency landing at Cuddeback Dry Lake. USSR launched the Meteor 1-2 weather satellite from Plesetsk for cloud and ice cover imaging, which investigated IR, thermal reflection/radiation from Earth's atmosphere, and acquired meteorological information for use by the weather service. NASA launched the Atmosphere Explorer-D (AE-D, Explorer 54) satellite from Cape Canaveral, Florida, to study chemical processes and energy transfer mechanisms in the Earth's atmosphere. The purpose of the AE-D mission, launched 6 October 1975, was to continue the investigation begun by AE-C of the chemical processes and energy transfer mechanisms that control the structure and behavior of the Earth's atmosphere and ionosphere in the region of high absorption of solar energy. This mission was planned to sample the high latitude regions at the same time that the AE-E mission was sampling the equatorial and low latitude regions. The same type of spacecraft as AE-C was used, and the payload consisted of the same types of instruments except for deletion of the extreme solar UV monitor and the Bennett ion mass spectrometer, which were part of the AE-E payload. The polar orbit provided the sampling of all latitudes and the perigee moved through all latitudes in 3 months and all local times in 4 months. Unfortunately, a failure in the solar power panels resulted in the termination of operations on 29 January 1976, after slightly less than 4 months of useful life. However, all the regions at the perigee altitudes were sampled during this time. The spacecraft re-entered the atmosphere about 1 month after telemetry ceased. To continue the correlated observations with the AE-E mission, AE-C was reactivated on 28 February 1976 to replace AE-D. The US Air Force launched Navstar 3 into orbit from Vandenberg, California, a GPS Block 1 technology prototype of the Navstar (Global Positioning System) satellite. T. Smirnova discovered asteroid #3652. NASA launched a Delta booster carrying the Solar Mesosphere Explorer (SME) from Vandenberg, California, on a flight that also carried the UK Oscar 9 research/amateur radio satellite to orbit. The Solar Mesosphere Explorer (SME) mission objective was primarily to investigate the processes that create and destroy ozone in the Earth's mesosphere and upper stratosphere. Some specific goals were to: (1) determine the nature and magnitude of changes in mesospheric ozone densities resulting from changes in the solar ultraviolet flux; (2) determine the interrelationship between solar flux, ozone, and the temperature of the upper stratosphere and mesosphere; (3) determine the interrelationship between ozone and water vapor; and (4) determine the interrelationship between nitrogen dioxide and ozone. The satellite experiment complement consisted of a solar ultraviolet spectrometer, an ultraviolet ozone spectrometer, an infrared radiometer, a 1.27-micrometer spectrometer, and a nitrogen dioxide spectrometer. In addition, a solar proton alarm detector was carried on-board to measure the integrated solar flux in the range 30-500 MeV. Spin stabilized at 5 rpm, the satellite was launched 6 October 1981 into a 3 AM to 3 PM sun-synchronous orbit. The spacecraft body was a cylinder approximately 1.7 m x 1.25 m, consisting of two major modules: the observatory module that housed the scientific instruments, and the spacecraft bus. The spin axis was oriented normal to the orbital plane. The command system was capable of executing commands in real time or from stored program control. Power was supplied by a solar cell array. The telemetry system was used either in a real-time or in a tape-recorder mode. All instruments on-board the SME were turned off in December 1988 because of energy considerations. NASA launched the UK Oscar 9 research/amateur radio satellite into space from Vandenberg, California, on a Delta booster that also lofted the Solar Mesosphere Explorer (SME) to orbit. Oscar 9 (UOSAT 1), launched 6 October 1981, was University of Surrey (UK) radio science, communication and geophysics research microsatellite that also carried an amateur radio package. UoSAT-OSCAR 9 was launched piggyback with NASA's Solar Mesosphere Explorer satellite. It weighed 52 kg, and was formed as a 740 x 420 x 420 mm box with a deployable gravity gradient boom. Among the accomplishments of the mission were the first on-board computer (IHU - Integrated Housekeeping Unit) for battery and attitude management, remote control, and experiments. UO-9 was also the first amateur satellite to carry an S-Band beacon, switched on for the first time on 19 May 1983 and heard on the first available pass that day (ref: RSGB Radio Communication, August 1983, p. 713). The S-Band and X-Band beacons on board UO-9 were described in an article in The Radio and Electronic Engineer, Vol. 52, No 8/9, pp. 412-416 August/September 1982. Built by the University of Surrey in the United Kingdom, UO-9 was UoSAT's first experimental satellite. It was a scientific and educational low-Earth orbit satellite containing many experiments and beacons but no amateur transponders. UO-9 was fully operational until it re-entered the atmosphere on 13 October 1989 from a decaying orbit after eight years of service. NASA launched STS 41 (Discovery 11, Shuttle 36) carrying the Ulysses solar polar probe and the Shuttle Solar Backscatter Ultraviolet (SSBUV) and INTELSAT Solar Array Coupon (ISAC) experiments to orbit. STS 41 was launched 6 October 1990 just 12 minutes after the two and a half hour launch window opened at 7:35 AM EDT; the brief delay was due to weather concerns. An additional 11 second hold occurred at T-5 minutes due to a Ground Launch Sequencer glitch, and at T-31 seconds, the count halted for 22 seconds to correct an orbiter purge, vent and drain (PVD) system glitch. The primary payload on STS 41, the ESA-built Ulysses spacecraft to explore the polar regions of the Sun, was deployed. Two upper stages, an Inertial Upper Stage (IUS) and a mission-specific Payload Assist Module-S (PAM-S), were combined together for the first time to send Ulysses toward an out-of-ecliptic trajectory. Other payloads and experiments flown on STS 41 were: Shuttle Solar Backscatter Ultraviolet (SSBUV) experiment; INTELSAT Solar Array Coupon (ISAC); Chromosome and Plant Cell Division Experiment (CHROMEX); Voice Command System (VCS); Solid Surface Combustion Experiment (SSCE); Investigations into Polymer Membrane Processing (IPMP); Physiological Systems Experiment (PSE); Radiation Monitoring Experiment III (RME III); Shuttle Student Involvement Program (SSIP) and the Air Force Maui Optical Site (AMOS) experiment. STS 41 ended 10 October 1990 when Discovery landed on revolution 66 on Runway 22, Edwards Air Force Base, California. Rollout distance: 8,532 feet. Rollout time: 49 seconds (braking test). Launch weight: 259,593 pounds. Landing weight: 196,869 pounds. Orbit altitude: 160 nautical miles. Orbit inclination: 28.45 degrees. Mission duration: four days, two hours, 10 minutes, four seconds. Miles traveled: 1.7 million. The orbiter was returned to the Kennedy Space Center on 16 October 1990. The flight crew for STS 41 was: Richard N. Richards, Commander; Robert D. Cabana, Pilot; William M. Shepherd, Mission Specialist 1; Bruce E. Melnick, Mission Specialist 2; Thomas D. Akers, Mission Specialist 3. NASA launched the Ulysses solar orbiter mission from the shuttle Discovery on its Jupiter flyby trajectory during the STS 41 flight. The primary objectives of Ulysses, formerly the International Solar Polar Mission (ISPM), were to investigate, as a function of solar latitude, the properties of the solar wind and the interplanetary magnetic field, of galactic cosmic rays and neutral interstellar gas, and to study energetic particle composition and acceleration. The 55 kg payload included two magnetometers, two solar wind plasma instruments, a unified radio/plasma wave instrument, three energetic charged particle instruments, an interstellar neutral gas sensor, a solar X-ray/cosmic gamma-ray burst detector, and a cosmic dust sensor. The communications systems was also used to study the solar corona and to search for gravitational waves. Secondary objectives included interplanetary and planetary physics investigations during the initial Earth-Jupiter phase and investigations in the Jovian magnetosphere. Ulysses was deployed from NASA's shuttle Discovery during the STS 41 mission on 6 October 1990. On leaving Earth, the spacecraft became the fastest ever artificially accelerated object, by means of two upper stages. The spacecraft used a Jupiter swingby on 8 February 1992 to transfer to a heliospheric orbit with high heliocentric inclination, and passed over the rotational south pole of the Sun in mid-1994 at 2 AU, and over the north pole in mid-1995. A second solar orbit took Ulysses again over the south and north poles in years 2000 and 2001, respectively. The Ulysses mission was extended until 30 June 2009, enabling it to continue operating while flying over the Sun's poles for the third time in 2007 and 2008. On 1 May 1996, Ulysses unexpectedly crossed the ion tail of Comet Hyakutake (C/1996 B2), revealing the tail to be at least 3.8 AU in length. The spacecraft was powered by a single radio-isotope generator. It was spin stabilized at a rate of 5 rpm and its high-gain antenna pointed continuously to the Earth, communicating on frequencies of 2111.6073/2293.1481 MHz and 8408.2099 MHz. A nutation anomaly after launch was controlled by CONSCAN. Ulysses was commanded to switch off its transmitter at 20:15 UTC on 30 June 2009 after 6842 days (18 years 8 months 24 days) in orbit, due to the fact its orbital path was carrying the spacecraft away from Earth, and the ever-widening gap progressively limited the amount of data that could be transmitted. The original mission planned for two spacecraft, one built by ESA and the other by NASA. NASA cancelled its spacecraft in 1981. A Long March 2C (Chang Zheng 2C, CZ-2C) rocket launched from Jiuquan, China, carried China's FSW-1 No. 4 surveillance satellite and Sweden's Freja scientific satellite into orbit. China FSW-1 No. 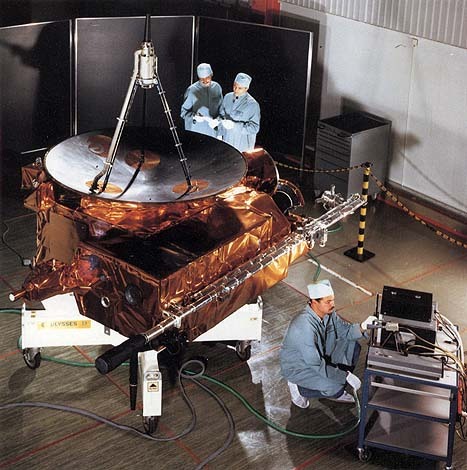 4 (Fanhui Shi Weixing) recoverable imaging satellite was launched 6 October 1992 on a Long March booster that also carried Sweden's Freja research satellite into orbit. FSW-1 No. 4 carried remote sensing and microgravity experiments. Its capsule was recovered 13 October 1992 after 6 days in orbit. A Long March 2C (Chang Zheng 2C, CZ-2C) rocket launched from Jiuquan, China, carried Sweden's Freja scientific satellite and China's FSW-1 No. 4 surveillance satellite into orbit. Freja was a Swedish/German satellite designed for research into the aurora, launched 6 October 1992 for ionospheric, auroral and magnetospheric studies. The satellite was launched piggyback on a Long March 2C (CZ-2C) rocket with China's FSW-1 No. 4 surveillance satellite, and weighed 214 kg in orbit. It was a Sun pointed, spin stabilized (10 rpm) satellite with a 2.2 m diameter. It made high resolution measurements in the upper ionosphere and lower magnetosphere. Data was received at Esrange, Kiruna, Sweden and at the Prince Albert Satellite Station in Canada's Saskatchewan Province. Intelsat 703 was launched from Cape Canaveral, Florida, on an Atlas IIAS booster, and positioned in geosynchronous orbit at 177 deg E 1994-1996; 57 deg E 1996-1999. 51 Pegasi, in the constellation of Pegasus, 47.9 light-years away from Earth, was discovered to be the first major star apart from the Sun to have a planet (an extrasolar planet) orbiting around it. NASA STS 86 (Atlantis 20, Shuttle 87) landed after the seventh Shuttle-Mir docking mission. Atlantis was launched 25 September 1997 on the seventh mission to the Russian Mir space station. The on-time liftoff occurred after final approval for the flight was given earlier in the day by NASA Administrator Daniel Goldin, following his review of independent and internal safety assessments regarding the safety of Mir and Shuttle-Mir missions. The reviews included assessments conducted routinely prior to the first Shuttle-Mir dockings, and two independent studies prompted by a spate of problems on the station, including the fire on 23 February and the collision on 25 June between a Progress resupply vehicle and the station's Spektr module. The STS 86 TI rendevous terminal initiation burn was carried out at 1:32 PM EDT on 27 September, and Atlantis docked with the SO (Docking Module) on the Mir complex at 3:58 PM EDT. At 4:06 PM EDT, the Shuttle took attitude control of the entire Mir complex. At 5:30 PM EDT Commander Solovyev opened the Mir hatch, and after pressure equalization, Commander Wetherbee opened the Shuttle hatch at 5:45 PM EDT, presenting the most welcome gift of Mir's new Motion Control Computer. The seventh Mir docking mission continued the presence of a US astronaut on the Russian space station with the transfer of physician David A. Wolf to Mir. Wolf became the sixth US astronaut in succession to live on Mir, to continue Phase 1B of the NASA/Russian Space agency cooperative effort. Wolf officially joined the Mir 24 team at noon EDT on 28 September. At the same time, Foale became a member of the STS 86 crew, and began moving his personal belongings to Atlantis. Foale returned to Earth after spending 145 days in space, 134 of them aboard Mir. His estimated mileage logged was 58 million miles (93 million kilometers), making his the second longest US space flight, behind Shannon Lucid's record of 188 days. His stay was marred by a collision on 25 June between a Progress resupply vehicle and the station's Spektr module, damaging a radiator and one of the four solar arrays on Spektr. The mishap occurred while Mir 23 Commander Vasily Tsibliev was guiding the Progress capsule to a manual docking, and depressurized the station. The crew sealed the hatch to the leaking Spektr module, leaving Foale's personal effects and several NASA science experiments inside, and repressurized the remaining modules. Following their arrival at the station 7 August, Mir 24 Commander Antaoly Solovyev and Flight Engineer Pavel Vinogradov conducted the internal space walk inside the depressurized Spektr module on 22 August, reconnecting 11 power cables from Spektr's solar arrays through a new custom made hatch for the module. During that space walk, Foale remained inside the Soyuz capsule attached to Mir, in constant communication with the cosmonauts and ground controllers. On 5 September, Foale and Solovyev conducted a six hour external extravehicular activity to survey damage outside Spektr and to try and pinpoint where the breach of the module's hull occurred. Two undamaged arrays were manually repositioned to better gather solar energy, and a radiation device previously left by Jerry Linenger was retrieved. The first joint US-Russian extravehicular activity during a Shuttle mission, which was also the 39th EVA in the Space Shuttle program, was conducted by cosmonaut Titov and astronaut Parazynski. On 1 October, they entered the Shuttle payload bay while Atlantis was docked to Mir. The airlock was depressurized at around 1:29 PM EDT and the astronauts emerged from the hatch on the tunnel adapter at around 1:35 PM EDT. They affixed a 121 pound Solar Array Cap to the docking module for future use by Mir crew members to seal off the suspected leak in Spektr's hull, and retrieved the four MEEP (Mir Environmental Effects Payload) exposure packages from Mir's SO module. The experiments were attached to the Docking Module by astronauts Linda Godwin and Rich Clifford during Shuttle mission STS 76 in March 1996. The MEEP packages investigate effects of exposure to the space environment on a variety of materials. The solar array cap was too large to be transferred through Mir, and would be needed to seal off the base of the damaged array on Spektr if and when the array was jettisoned by cosmonauts. In addition to retrieving the MEEP, Parazynski and Titov tested several components of the Simplified Aid for EVA Rescue (SAFER) jet pack, a small jet-backpack designed for use as a type of life jacket during station assembly. The airlock was repressurized at 6:30 PM EDT. During the six days of docked operations, the joint Mir 24 and STS 86 crews transferred more than four tons of material from the SPACEHAB Double Module to Mir, including approximately 1700 pounds of water, experiment hardware for International Space Station Risk Mitigation, experiments to monitor Mir for crew health and safety, a gyrodyne, batteries, three air pressurization units with breathing air, an attitude control computer and many other logistics items. The new motion control computer replaced one that had experienced problems in recent months. The crew also moved experiment samples and hardware and an old Elektron oxygen generator to Atlantis for return to Earth. During the flight, Wetherbee and Bloomfield fired small jet thrusters on Atlantis to provide data for the Mir Structural Dynamics Experiment (MISDE), which measured disturbances to the space station's components and its solar arrays. Other experiments conducted during the mission were the Commercial Protein Crystal Growth investigation; the Cell Culture Module Experiment (CCM-A), the Cosmic Radiation Effects and Activation Monitor (CREAM) and the Radiation Monitoring Experiment-III (RME-III); the Shuttle Ionospheric Modification with Pulsed Local Exhaust (SIMPLE) experiment; and the Midcourse Space Experiment. Two NASA educational outreach programs were also conducted, Seeds in Space-II, and Kidsat. Atlantis undocked from Mir at 1:28 PM EDT on 3 October. Just after undocking, the Shuttle continued to back away through a corridor similar to that used during approach with periodic stops to "stationkeep" in order to collect data for the European laser docking sensor. Atlantis backed away in this manner until it reached a distance of 190 meters below Mir. The shuttle then moved back to within 70 meters of the station and conducted a 46 minute flyaround focused on the damaged Spektr Module to determine the location of the puncture in its hull. Solovyev and Vinogradov opened a pressure regulation valve to allow air into the Spektr module while the STS 86 crew looked to see if they could detect seepage or debris particles that would indicate the location of the breach in the damaged module's hull. As expected, the Shuttle crew observed evidence that the leak seemed to be located at the base of the damaged solar panel. (The cap delivered by the Atlantis crew was designed to repair this puncture.) Final separation of Atlantis from Mir took place around 4:28 PM EDT. STS 86 ended 6 October 1997 when the crew fired the engines to deorbit at 16:47 EDT on revolution 170, and Atlantis landed on Runway 15, Kennedy Space Center, Florida, on the first opportunity after two opportunities on 5 October were waved off due to heavy cloud cover. Rollout distance: 11,947 feet (3,641 meters). Rollout time: one minute, 22 seconds. Orbit altitude: 184 statute miles. Orbit inclination: 51.6 degrees. Mission duration: 10 days, 19 hours, 20 minutes, 50 seconds. This was the last flight of Atlantis prior to departure to California for its second Orbiter Maintenance Down Period (OMDP). The orbiter was scheduled to return to KSC in late August 1998 to begin preparations for STS 92, the third International Space Station assembly flight. The flight crew for STS 86 was: James D. Wetherbee, Commander; Michael J. Bloomfield, Pilot; Vladimar G. Titov, (RSA) Mission Specialist; Scott E. Parazynski, Mission Specialist; Jean-Loup J.M. Chretien, (CNES) Mission Specialist; Wendy B. Lawrence, Mission Specialist; David A. Wolf, Mission Specialist (returned on STS 89); C. Michael Foale returned from Mir (launched on STS 84). Japan's N-SAT-110 (Superbird 5) was launched from Kourou on an Ariane 42L and positioned in geosynchronous orbit at 110 deg E.
N-SAT-110, also known as Superbird 5, was launched 6 October 2000. The satellite was jointly owned by SCC (Space Communications Corporation of Tokyo) and JSat (Japan Satellite Systems). SCC controlled the vehicle on orbit. The satellite carried 24 Ku-band transponders. By 15 October 2000, N-SAT-110 was in a 35610 x 35752 km x 0.1 deg orbit drifting past 109 deg E. It was positioned in its final geosynchronous orbit at 110 deg E. As of 4 September 2001, it was at 110.06 deg E drifting 0.012 deg W per day. NASA released detailed pictures from the Mars Reconnaissance Orbiter of Victoria crater with the Opportunity rover on the rim above it. 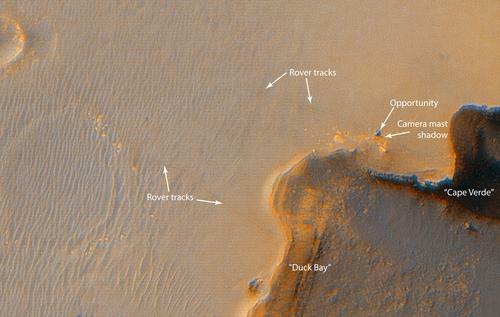 NASA MRO image of MER Opportunity near the rim of Victoria Crater. 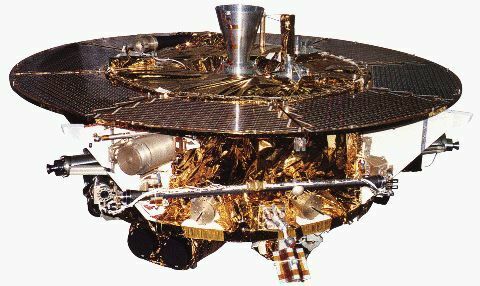 The Mars Reconnaissance Orbiter (MRO), launched 12 August 2005 on an Atlas V, was designed to orbit Mars over a full Martian year and gather data with six scientific instruments, including a high-resolution imager. The science objectives of the mission are to: characterize the present climate of Mars and its physical mechanisms of seasonal and interannual climate change; determine the nature of complex layered terrain on Mars and identify water-related landforms; search for sites showing evidence of aqueous and/or hydrothermal activity; identify and characterize sites with the highest potential for landed science and sample return by future Mars missions; and return scientific data from Mars landed craft during a relay phase. MRO was planned to return high resolution images, study surface composition, search for subsurface water, trace dust and water in the atmosphere, and monitor weather. The launch window opened at Kennedy Space Center on 10 August 2005, with launch opportunities available until 5 September. The cruise to Mars took about seven months and included checkouts, calibrations, navigation, and three trajectory correction maneuvers (TCMs). The planned fourth TCM and possible fifth TCM were not required, saving 60 pounds (27 kg) of fuel, usable during MRO's extended mission. On 10 March 2006, MRO reached Mars and performed a Mars orbit insertion maneuver, passing under the southern hemisphere of Mars at an altitude of 370–400 km (230–250 mi) and firing its main engines for about 27 minutes. Signals that the burn had started reached Earth at 21:24 UT (4:24 PM EST) on 10 March. With 6 minutes left in the burn MRO passed behind Mars as seen from Earth. Radio communication resumed when it re-emerged about 30 minutes later. The 1641 second orbit insertion burn slowed the spacecraft by about one km/sec, leaving it in a 400 x 35000 km polar capture orbit with a 35.5 hour period. The helium pressurization tank was colder than expected, which reduced the pressure in the fuel tank by about 21 kilopascals (3.0 psi). The reduced pressure caused the diminished engine thrust by 2%, but MRO automatically compensated by extending the burn time by 33 seconds. Shortly after insertion, the periapsis (closest approach to Mars) was 426 km (265 mi) from the surface (3,806 km (2,365 mi) from the planet's center). The apoapsis (the farthest distance from Mars) was 44,500 km (27,700 mi) from the surface (47,972 km (29,808 mi) from the planet's center). Aerobraking was used over the next five months, from 30 March to 30 August 2006, to lower the orbit. MRO fired its thrusters twice more in September 2006 to fine-tune its final, nearly circular science orbit to approximately 250 to 316 km (155 to 196 mi) above the Martian surface (with periapsis over the south pole and apoapsis over the north pole). There are twelve sun-synchronous orbits per day so that the orbiter will always see the ground at 3:00 PM local time at the equator. The SHARAD radar antennas were deployed on 16 September 2006. All of the scientific instruments were tested and most were turned off prior to the solar conjunction which occurred from 7 October to 6 November 2006. The "primary science phase" began after the conjunction ended. MRO took its first high resolution image from its science orbit on 29 September 2006, resolving items as small as 90 cm (3 feet) in diameter. On 6 October, NASA released detailed pictures from the MRO of Victoria crater with the Opportunity rover on the rim above it. On 17 November 2006 NASA announced the successful test of the MRO as an orbital communications relay: Using the NASA rover Spirit as the point of origin for the transmission, the MRO acted as a relay for transmitting data back to Earth. HiRISE continues to return images enabling discoveries regarding the geology of Mars. Among these is the banded terrain observations indicating the presence and action of liquid carbon dioxide (CO2) or water on the surface of Mars in its recent geological past. HiRISE photographed the Phoenix lander during its parachute descent to Vastitas Borealis on 25 May 2008 (sol 990). On 6 August 2012 (sol 2483) the orbiter passed over Gale crater, the landing site of the Mars Science Laboratory mission, during its EDL phase. The HiRISE camera captured an image of the Curiosity rover descending with its backshell and supersonic parachute. On 3 March 2010, the Mars Reconnaissance Orbiter passed another significant milestone, having transmitted over 100 terabits of data back to Earth, which was more than all other interplanetary probes sent from Earth combined. Science operations took place nominally from the end of solar conjunction in November 2006 to the start of the next solar conjunction in November 2008, roughly one Martian year. Following the nominal mission, extended science and communications relay missions have been undertaken. In November 2006, problems began to surface with two MRO instruments: A stepping mechanism in the Mars Climate Sounder (MCS) skipped on multiple occasions, resulting in a field of view that is slightly out of position. By December normal operations of the instrument were suspended, although a mitigation strategy allows the instrument to continue making most of its intended observations. Also, an increase in noise and resulting bad pixels has been observed in several CCDs of the High Resolution Imaging Science Experiment (HiRISE). Operation of the camera with a longer warm-up time has alleviated the issue, but the cause is still unknown and the problem may return. The orbiter continued to experience recurring problems in 2009, including four spontaneous resets, culminating in a four-month shut-down of the spacecraft from August to December. While engineers did not determine the cause of the recurrent resets, they have created new software to help troubleshoot the problem should it recur. The Mars Reconnaissance Orbiter consists of a main bus, constructed of titanium, carbon composites, and aluminum honeycomb. Extending from the bus are two solar panel wings and a 3 meter high-gain antenna dish. The bus houses the propulsion system, telecommunications, command, guidance, and science instruments. The maximum spacecraft mass was 2180 kg, including 1149 kg of propellants. Propulsion is provided by a total of 20 thrusters. Six 170N monopropellant (hydrazine) main-engine thrusters were used for the Mars Orbit insertion burn, which used about 70% of the total fuel onboard. Six 22N thrusters are used for trajectory correction maneuvers and eight 0.9N thrusters for pointing. All thrusters are fed from a single propellant tank mounted near the center of the main bus. A pressurant tank is used to force propellant to the motors. Spacecraft control is achieved with the use of reaction wheels and reaction control system thrusters. Navigation and attitude knowledge is determined by 16 Sun sensors, two star tracker cameras, and two inertial measurement units which use accelerometers and gyroscopes. Two way telecommunications is done via X-band at about 8000 MHz, primarily through the 3 m diameter steerable high-gain dish antenna. Two low-gain Ka-band antennas, mounted on the high-gain dish, are also available for transmission and reception. Two transponders and three TWT amplifiers allow maximum data rates of 6 megabits/sec. Power is provided by the two solar cell array wings mounted on opposite side of the bus. Each array has an area of 10 square meters and contains 3744 solar cells. The panels produce 1000 Watts at Mars which is used to run the equipment directly, and to charge two nickel-hydrogen 50 A-hr, 32-volt batteries. Thermal control is achieved by a combination of radiators, surface coatings, insulation, and heaters. MRO's science payload includes the High Resolution Imaging Science Experiment (HiRISE), a visible stereo imaging camera; the Compact Reconnaissance Imaging Spectrometer for Mars (CRISM), a visible/near-infrared spectrometer to study the surface composition; the Mars Climate Sounder (MCS), an infrared radiometer to study the atmosphere, a shallow subsurface sounding radar (SHARAD) provided by the Italian Space Agency to search for underground water; the Context Camera (CTX), to provide wide-area views; and the Mars Color Imager (MARCI), to monitor clouds and dust storms. In addition, there are three engineering instruments aboard MRO: the Electra UHF communications and navigation package, used as a relay between the Earth and other Mars missions; the optical navigation camera, tested for possible navigational use on future planetary spacecraft; and the Ka-band telecommunications experiment package, for testing high performance Ka-band communications. Engineering accelerometer data is used to study the structure of the Martian atmosphere, and tracking of the orbiter is used to study the gravity field of Mars. NASA's MESSENGER made its fifth planetary flyby on its way to Mercury orbit, passing Mercury a second time at roughly 200 km altitude in its heliocentric orbit. The Mercury Surface, Space Environment, Geochemistry and Ranging (MESSENGER) mission was designed to study the characteristics and environment of Mercury from orbit. Specifically, the scientific objectives of the mission were to characterize the chemical composition of Mercury's surface, the geologic history, the nature of the magnetic field, the size and state of the core, the volatile inventory at the poles, and the nature of Mercury's exosphere and magnetosphere over a nominal orbital mission of one Earth year. MESSENGER launched into a parking orbit on 3 August 2004 on a Delta 7925H (a Delta II Heavy launch vehicle with nine strap-on solid-rocket boosters). The Delta booster second stage's second burn raised the orbit, then the PAM-D solid motor burned to put the probe on an escape trajectory into a 0.92 x 1.08 AU x 6.4 deg heliocentric orbit. The spacecraft was injected into solar orbit 57 minutes after launch. The solar panels were then deployed and the spacecraft began sending data on its status. One year after launch, on 2 August 2005, MESSENGER flew by Earth at an altitude of 2347 km. On 12 December 2005 at 11:30 UT, MESSENGER fired its large thruster for 524 seconds, changing the spacecraft velocity by 316 m/s and putting it on course for its 24 October 2006 Venus flyby at an altitude of 2990 km. The second Venus flyby took place on 5 June 2007 at 23:08 UT (7:08 p.m. EDT) at an altitude of approximately 337 km. The first of three Mercury flybys, all at roughly 200 km altitude, occurred on 14 January 2008 at 19:04 :39 UT, and the second on 6 October 2008 at 08:40:22 UT. The third took place on 29 September 2009 at 21:54:58 UT at a distance of 228 km. There were also five deep space manuevers. Data collected during the Mercury flybys was used to help plan the scientific campaign during the orbital phase. Mercury orbit insertion took place with a 15 minute burn starting at 00:45 UT on 18 March 2011 (8:45 p.m. 17 March EDT) requiring a delta-V of 0.862 km/s from the Aerojet 660N engine. Science observations began on April 4 at 20:40 UT (4:40 p.m. EDT). The nominal orbit had a periapsis of 200 km at 60 degrees N latitude, an apoapsis of 15,193 km, a period of 12 hours and an inclination of 80 degrees. The periapsis slowly rose due to solar perturbations to over 400 km at the end of 88 days (one Mercury year) at which point it was readjusted to a 200 km, 12 hour orbit via a two burn sequence. Data was collected from orbit for one Earth year, the end of the primary mission was in March 2012. Extensions to the mission allowed the spacecraft to operate for an additional 3 years until the propellant necessary to maintain its orbit was exhausted. The MESSENGER spacecraft impacted the surface of Mercury as planned on 30 April 2015 at 19:26 UT (3:26 p.m. EDT). Global stereo image coverage at 250 m/pixel resolution was completed. The mission has also yielded global composition maps, a 3-D model of Mercury's magnetosphere, topographic profiles of the northern hemisphere, gravity field, altitude profiles of elemental species, and a characterization of the volatiles in permanently shadowed craters at the poles. The MESSENGER spacecraft was a squat box (1.27 m x 1.42 m x 1.85 m) with a semi-cylindrical thermal shade (roughly 2.5 meters tall and 2 meters wide) for protection from the Sun and two solar panel wings extending radially about 6 meters from tip to tip. A 3.6 meter magnetometer boom also extended from the craft. The total mass of the spacecraft was 1093 kg, 607.8 kg of which was propellant and helium. The structure was primarily graphite-cyanate-ester (GrCE) composite and consisted of two vertical panels which supported two large fuel tanks, and two vertical panels which supported the oxidizer tank and plumbing panel. The four vertical panels made up the center column and were bolted at their aft ends to an aluminum adapter. A single top deck panel mounted the LVA (large velocity adjust) thruster, small thrusters, helium and auxiliary fuel tanks, star trackers and battery. Main propulsion was via the 645-N, 317-s bipropellant LVA thruster, four 22-N monopropellant thrusters providing spacecraft steering during main thruster burns, and ten 4-N monopropellant thrusters used for attitude control. There was also a reaction-wheel attitude control system. Knowledge for attitude control was provided by star tracking cameras, an inertial measurement unit, and six solar sensors. Power was provided by the solar panels, which extended beyond the sunshade and were rotatable to balance panel temperature and power generation, and provided a nominal 450 W in Mercury orbit. The panels were 70% optical solar reflectors and 30% GaAs/Ge cells. The power was stored in a common-pressure-vessel nickel-hydrogen battery, with 11 vessels and 2 cells per vessel. Communications were in the X-band, with downlink through two fixed phased-array antenna clusters, and uplink and downlink through medium- and low-gain antennas on the forward and aft sides of the spacecraft. Passive thermal control, primarily a fixed opaque ceramic cloth sunshade, was utilized to maintain operating temperatures near the Sun. Radiators were built into the structure and the orbit was optimized to minimize infrared and visible light heating of the spacecraft from the surface of Mercury. Multilayer insulation, low conductivity couplings, and heaters were also used to maintain temperatures within operating limits. Five science instruments were mounted externally on the bottom deck of the main body: the Mercury Dual Imaging System (MDIS), Gamma-Ray and Neutron Spectrometer (GRNS), X-ray Spectrometer (XRS), Mercury Laser Altimeter (MLA), and Atmospheric and Surface Composition Spectrometer (MASCS). The Energetic Particle and Plasma Spectrometer (EPPS) was mounted on the side and top deck and the magnetometer (MAG) was at the end of the 3.6 m boom. Radio Science (RS) experiments used the existing communications system. The highly successful orbital mission came to an end after more than four years in orbit around Mercury, as the spacecraft ran out of propellant and the force of solar gravity caused it to impact the surface of Mercury at 3:26 p.m. EDT on 30 April 2015. More information about the spacecraft and its research results can be found on the MESSENGER Web site at John Hopkins University's Applied Physics Laboratory.